Former Pan-Asia Risk Reduction (PARR) fellow Ibnu Rusydy co-authored a paper on predicting earthquake damages and casualties in Indonesia. The Banda Aceh city is located in an earthquake-prone region and Kuta Alam is the most populated sub-district in Banda Aceh and has many public buildings. Earthquakes from the Aceh segment fault and the Seulimeum fault could occur with various magnitudes and times. The earthquakes could cause structural damages of buildings and injure the Kuta Alam residents. Study of damage prediction caused by earthquakes for different magnitudes and times has been conducted for the Kuta Alam sub-district by using GIS model analysis. 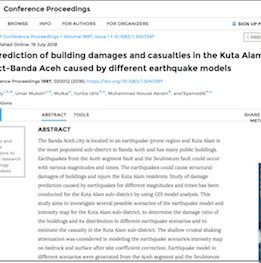 This study aims to investigate several possible scenarios of the earthquake model and intensity map for the Kuta Alam sub-district, to determine the damage ratio of the buildings and its distribution in different earthquake scenarios and to estimate the casualty in the Kuta Alam sub-district. The shallow crustal shaking attenuation was considered in modeling the earthquake scenarios intensity map on bedrock and surface after site coefficient correction. Earthquake model in different scenarios were generated from the Aceh segment and the Seulimeum fault of the Sumatra Fault Zone. The damage ratios of various types of buildings were calculated using fragility curves. Population data of each building in different occupancy time, damage ratio, and injury ratio was used to compute the number of injuries due to a scenario earthquake. The results reveal that the Kuta Alam sub-district respond 7.3 – 9.3 MMI from 6.5 – 7.0 Mw of earthquake models from different sources. The worst event is an Mw 7.0 earthquake located along the Aceh segment which could cause damage 49% – 71% of building and injure 5.3% – 24.8% of building populations at 2 Pm (day-time) event and injure 1 – 4 people in houses at 2 Am (night-time). An Mw 6.5 earthquake along the Seulimeum fault damages 30%- 53% of buildings and injure 3.3% – 18% of population at daytime and injure 1 – 4 people in houses at the nighttime. To decrease the damage and injury, Kuta Alam sub-districs authority has to develop mitigation and preparedness program to the Kuta Alam community and restoration program to buildings.